Rebel Legion :: View topic - Boots - Define "Suitable Substitute"
Boots - Define "Suitable Substitute"
Posted: Mon Nov 12, 2007 1:17 am Post subject: Boots - Define "Suitable Substitute"
I have a question regarding the boots for the X-wing pilot. The standard for the pilot says "Mid Calf Black boots (or suitable substitute)." I would like to throw down the argument that black riding boots could also be a possibility, if nothing else, serve as a "suitable substitute." Check out Luke's boots here. Keep in mind Mark Hamill is relatively short. Those are definitely higher than just mid-calf. They seem pretty close to knee-high in my opinion, especially his left leg with the flare holder. From a production standpoint it'd make sense that Lucasfilm didn't want to buy another set of boots for Hamill, since they would barely be seen in the film in this costume. But since he wore black riding boots in his Ceremonial outfit, it would be cost effective to just reuse those boots. It is my understanding that most pilots tend to tuck the pants in their boots, then fold excess fabric over the top of the boot so the boots end up appearing shorter anyway, so even if knee-highs are used, it shouldn't look all that far off. In the above pics, Hamill's right leg looks pretty standard for RL pilots. Good points. The only thing I can say is that the images you are refrencing are promo shots...in the first one, the flak vest is on backwards . Oh, absolutely. I wasn't gonna wear the leg flare on my future pilot costume at my knee, and show off the fact that I'm wearing knee-highs. I'd just fold the fabric over so they'd look a bit more "normal. " Just wanted to make sure wearing those boots would be okay in the first place. I use these boots, as do many others. Just paint the buckles black, or remove them completely. If I'm going to be doing a lot of walking for a parade of something, I wear lace up military combat boots. Not accurate, but look good from ten feet away, and much more comfortable. Parts of Star Wars lists the Chippewa 27909 as acceptable for X Wing, TIE and Jedi Luke ROTJ, that's what I use. They are 17 inch tall motorcycle boots. Problem is they cost an arm and a leg. I have big calves, but I was able to get a shoemaker to stretch the boots about 2 inches at the tops. You get a thumbs up from me on them. My boots I use are at least that tall. I use engineer boots also. I use them for my pilot, RFT, and Jedi as well as my imp officer and most importantly I use them to ride my motorcycle That was the best money I ever spent in footwear I can tell you. I was planning on using riding boots as well. At least until I am able to find something similar to the engineer boots small enough... This costuming thing has really made me feel short! For the Sunrider Base pilot group project, we are recommending the engineer boots too. For easier availability for one thing, cost for another. Some of us have bought the real deal [german tanker boots] and found them to be WAY to tight on the calves! I agree that the promo pics are of Luke wearing his Jedi boots or what would become them. The RFT's and pilots mostly seem to be wearing the tanker boots. They are only mid calf approx. 13 inches from the bottom of the heel to the top of the boot. I have a pair of top of calf boots that I wear for my RFT, but I blouse the pants over the boots using blousing bands to make the boots look mid-calf. I may do that for pilot too. I can't find those German boots in my size either b/c of my calves and the fact I can never find them larger than a 10. The nice thing about it is that if we all start to use those leatherup boots, it'll just look like those are the correct ones to use since everyone will have them. if we all start to use those leatherup boots, it'll just look like those are the correct ones to use since everyone will have them. Good call. These boots are the best combination of accuracy, comfort, and cost that I've found. 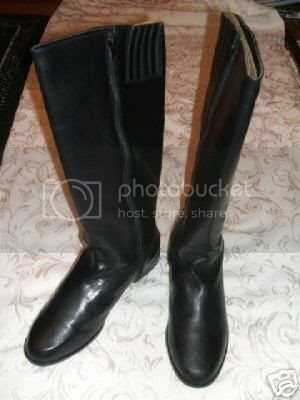 It seems to be an ongoing problem for guys to be able to find riding boots that fit because riding boots tend to be tight around the calf, hence why male pilots have come up with these alternatives that work out nicely. Very true Princess, although I think german men have small calves. So... it's cool to wear riding boots?